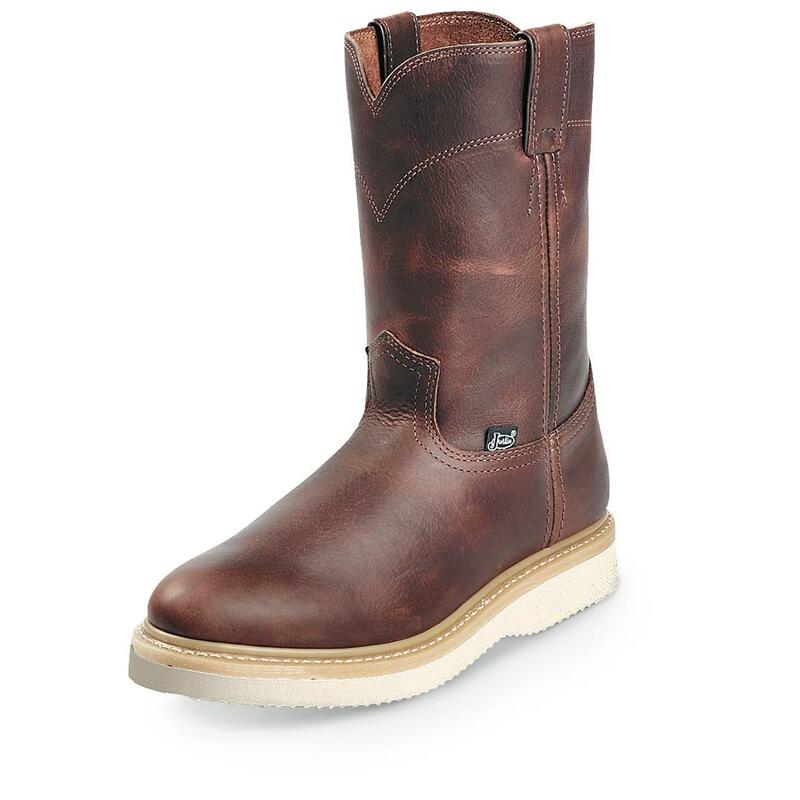 World famous for bootmaking expertise, Justin Boots® have been the standard of the West since 1879. Among the most durable and comfortable Boots around, always made with the highest quality materials, style and workmanship. Each approx. 10"h., 32 oz. Weight per boot (approx. ): 32 oz. Justin Mens 10 Pull-On Roper Work Western Boots is rated 3.8 out of 5 by 4. Rated 2 out of 5 by CalSuarez from too small The top of the boot is not deep like western boots. I tore the loop off trying to get my foot in. I also order these in double E not sure if that helped or not. Rated 5 out of 5 by unkamikee from Great Boots I'm posting this because I was surprised by the several low ratings. I came here online to buy another pair. They fit great, were true to size and I've worn them nearly everyday for 18 months. They're comfortable and I use them to hike due to snakes in Arizona. The soft soles grip great on rocky terrain. No laces to get hung up in brush. I have built block walls, put in gardens with lotsa fencing and use them for my dirt work with my backhoe as they're impervious to dirt. I've mixed concrete, spilled oil on them and they just keep going. The toe on the right boot is starting to separate and I'm not complaining. I highly recommend these boots, especially for the price. Rated 3 out of 5 by Unka Mikee from They run big Quality is OK, I might wait for another brand. They do run large, I have to put on an extra pair of socks to keep them from sliding around on the heel.